Many a fan steals a favorite image of him for blog-posty uses, Johnny Cash flipping the bird with a twisted up face. Like a lot of his fans, I adore that image. Defiant. Outlaw. Pissed off. There’s a heck of a story about that image, and it’s told well here. You should go read it and come back. I thought I’d steal a different image of him though today. 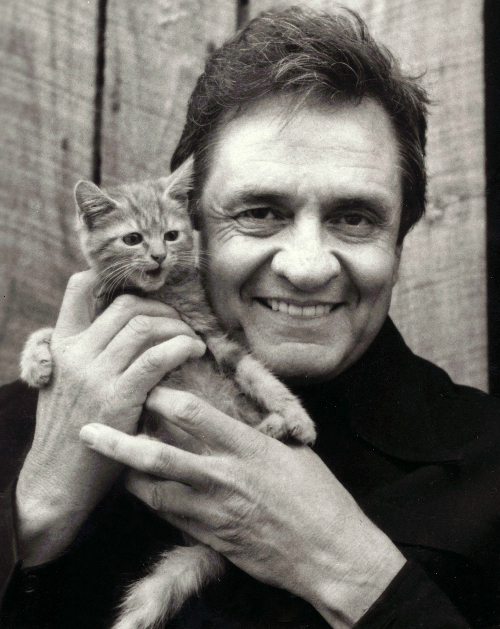 Here’s Johnny holding a kitteh. Had J.R. Cash lived to today, he’d have been 81. A friend who could play just about any Cash song you could name (on the guitar, not the radio) made me appreciate the music. Before that, I was rather close-minded about it. I’m so glad for that. Because friend, if you’ve never sat down and listened to the entire Folsom album, you’re denying yourself one of life’s better pleasures. If you haven’t, well, here it is. Added bonus: Johnny and June lighting up a stage. This entry was posted in Appreciation, Birthdays by Aaron B. Pryor. Bookmark the permalink.